Practical training will also take place on a canal craft to ensure that candidates have the required level of boat-handling skills to control a passenger vessel, with particular attention being paid to the comfort and safety of the passengers and crew on board. Three days, consisting of two days preparation and one day MCA examination; these days can be run either consecutively or individually, by arrangement. Boatmaster courses can be held anytime during the normal canal cruising season of April to October and at other times subject to the availability of the canal system for navigation. The first hour was spent steering and getting used to the boat. One of its advantages is that it does not have a full-length cabin, so the helmsman has a good view of how the bow is responding. We then practised stopping quickly, for example when meeting another boat coming through a bridge. On my previous boating holidays, this had always resulted in panic, going into full reverse, and ending up sideways across the cut. So we then practised thoroughly going gently into reverse, then going ahead, applying as little power as possible to keep the boat steady on course. Then it was on to the bogey of all narrowboats - reversing. We have all been told it is impossible to drive a narrowboat astern in a straight line, but after half an hour of Malcolm’s patient instruction we were pointing our stern wherever we wanted to go - magic! This was followed by coming alongside, with the basic ropework skills you need to moor up. By this time it was time to turn round, firstly in a winding hole, then for good measure at a junction. On the way back we were taught the procedures if you should go aground, with the boat pole left firmly in its place on the roof all the time. 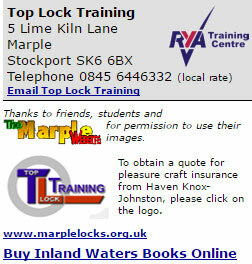 After lunch we set off to go through the Marple Flight of locks on the Peak Forest Canal Here we were joined by Ken Cook, who helps with the training courses.